A scheduling conflict meant we missed a preview event for Deus Ex: Mankind Divided earlier this week, but Matt managed to Skype producer Olivier Proulx and pick his brain about the process of building the game. Q: What did I miss having not been able to attend the hands-on? Olivier Proulx: I’m sorry to say you missed out on a lot! We came here with a near-final version of the game and asked people to play the first act. They played the Dubai intro, which is the first map of the game where you reintroduced to Adam Jensen. You go straight into infiltration mode – it’s a bit more of a straightforward map – but we use it to teach you some of the game mechanics so there’s a lot of tutorial elements. We even have some hologram sections where we pause the game and give you the option to practice the core mechanics, so you can get comfortable with the stealth systems and the combat systems, and the cover – all that great stuff. And you have a lot of information as to how to use the controls. 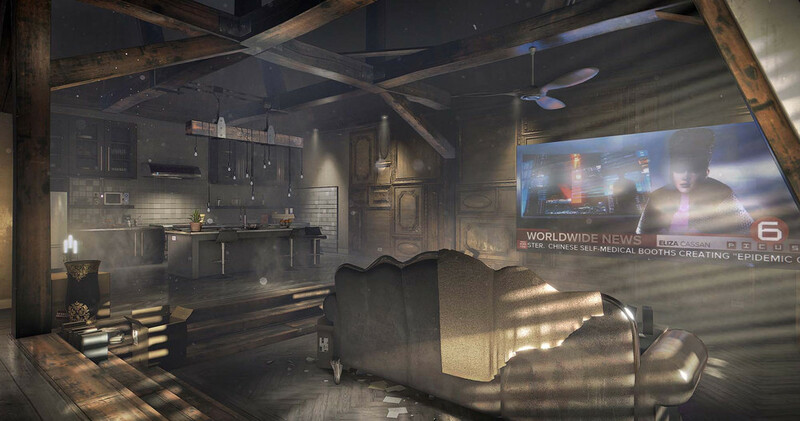 Then you move into I would say the meaty part of Mankind Divided, which is set in Prague. There’s a lot of options to just explore, go off the beaten path in a very dense city where you can find side missions and great narrative tidbits hidden everywhere. Obviously you have your main missions you can follow, but you can really get lost – in a good sense – in the city. Then we encouraged players to move forward a little bit and go to Golem City, which is a ghetto outside of Prague, a slums area where unfortunately a lot of the people with body augmentations are being pushed away, while a lot of politics plays around what to do with them following the big events at the end of the previous game. Also, Breach mode was available, and so far it’s been pretty positive response to the preview tour. Q: What can you tell us about the new augmentations? Olivier Proulx: All the augmentations that we have in Human Revolution are back, which is great – you have a lot of ways to customise your character with a lot of passive augmentations. With MD, we decided that the new augmentations needed to be more active, so you actually trigger some while playing. We feel that these are very visceral and empowering – we have lots of cool augmentations hidden in Jensen’s mechanical arm. So, we have the Nano Blade. As you know, the blade has always been a kind of iconic part of the character. In HR, we only saw the blade in takedowns, but now you can use it as a projectile in different ways. There’s a Tesla, which is more like a stealth non-lethal option, and then you have a really cool Titan Shield that if you are a more combat-oriented player you can use it to basically be a tank for two seconds. It looks really awesome. There’s also remote hack for stealth players, so you can trigger different objects and disable cameras temporarily. So, a lot of really cool active augmentations were added. There’s also a dash that allows you to move really quickly through environments. And obviously, you can go deep with how you wanna use them. What’s the deal with the retooled Social Enhancer augmentation? Olivier Proulx: That was one that was a well-loved augmentation in Human Revolution, so we brought it back. We refined the UI and how it talks to you, but we also give you more options to use it. In HR you had a few social debates that were very important moments in the story. You could use the social augmentation there, and we still have a few of those fleshed out big debates where it helps you read personality traits of a character, and helps you steer the conversation in a way that’s going to be good for you. But we also peppered the game with a lot of other more standard conversations where you can use that augmentation, and we see that come through a lot in some of the side missions. So, if you’re investing your precious Praxis Points in social augmentations, you’re going to be rewarded with more options to use it. What can you tell us about the game’s weapons? Olivier Proulx: I think what we tried to do with the weapons is, we tried to not necessarily have dozens of weapons in your arsenal, but instead to go deep with the weapons so you can really customise them. So, you have long range lethal option, long range non-lethal options with different types of rifles: you have combat rifles, shotguns, stun guns, pistols… all that great stuff. The battle rifle as well, which is very powerful. There’s also a grenade launcher, which is a tough one to get but very powerful. My point though is with each one of these, you can go deep, and invest some crafting parts to improve the reload or different aspects of how the weapon is powerful. You can attach different accessories to your weapon, so let’s say you want a more silent pistol you can put a silencer on it, but doing that will make the ammo a bit less powerful. So it’s like a balancing act. You also have a lot of ammo types: EMP ammo to take down robots and cameras, or armour piercing ammo – you can mix and match. We also have different grenade types. You can customise your own mines, so if you’re more of a combat player or someone who wants to use a lot of the weaponry, there’s definitely a lot of fun to be had. Q: In what order were the game’s component parts worked on? Did story come first, or…? Olivier Proulx: I think that HR was not a perfect game, but we knew it’s strengths and we wanted to build on top of the combat, stealth, hacking, and social stuff. With that in mind, obviously the early part of production was about nailing the story, the story beats, character motivation. And then with the story beats we went through what we called a blueprint process. That’s where on top of each story beat we think about each level: where is the game gonna take place? What type of level design do we wanna convey? What sort of mechanics should be used? The whole balancing act with the game. So we laid that out in a huge Excel file when we started production, and that’s how we started producing levels and producing gameplay. Making a Deus Ex game is not an easy thing to do, and we had to go through some moments in production where we were not necessarily happy with how a blueprint played out. So we had to rewrite some elements and reshuffle a few things here and there, which is kind of a normal thing to do. The story comes through a lot through the players actions, and there’s a lot of emergent gameplay, so we had to do some adjustments along the way. Q: As you mentioned, choice and consequence is a big part of Deus Ex. What does that mean for the QA team? Is one group assigned to a stealth playthrough, while another kills everything in sight? Olivier Proulx: Yeah, we have different parts of the QA team. Some just do fast walkthroughs to cover the main storyline very quickly, to make sure we are good in all-round stability. Some testers do the stealth aspects, or combat, or a mix of all. Sometimes we try to do destructive testing while being very creative to push all of those systems to their limits. So it takes a very large QA team, but for any triple-A game at that level you need a lot of good testers to report all the bugs. Choice and consequence is difficult as there are so many things that are reflected in the world based on your actions. For example, the first map of the game in Dubai and I guess it’s a more straightforward map, but even there there is are secondary objectives that has an impact on the world. There are four events that are tracked for you, and later down the road people’s dialogues or some emails are going to reflect how you performed – and that’s just one example. To keep track of all this it’s a lot of scripting, a lot of states to produce in terms of cutscenes and level design. And then just to keep track of everything to test, we have a huge Excel file that we call the tree of life [laughs]. Our test team just go through all possibilities, so it can be like an exponential testing process. But we know from the get-go that we have to test thoroughly, so we produce a lot of documentation for the QA team. Following that, is a lot of debugging and fun times at the end of the project to make sure everything works well. At the end of the day it’s so rewarding when it works well, and I think the beauty of it is everyone has a different experience. We hope players share the experience, and are surprised by the amount of depth to the choice and consequences in the game. Q: Do you have stats on how many people completed Human Revolution and how? If so, did that information affect how Mankind Divided was designed? Olivier Proulx: We didn’t have a lot, but yeah, we did have some stats, and we did some surveys as well. I think early on we knew that combat was not used as much – not because people didn’t want it, because it wasn’t good enough in terms of control, and because there were not enough cool augmentations to play with. So early on, looking at how people played and our own assessment of the quality of that option in HR, we wanted to bring it up a notch. Not to make it a combat game, just to give it as much oomph as the stealth. 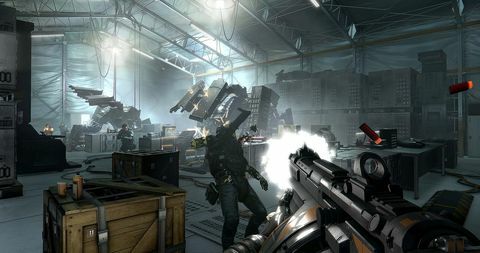 Ultimately Deus Ex is about freedom of choice and creativity for players, so if you wanna play combat, if you wanna get out of a tough spot when you break stealth… we wanted combat to be a really valid option and avoid players reloading their save games. So that’s part of the things we looked at. For MD we had a much more sophisticated matrix tracking system, looking at everything we were doing so we could see how our QA was playing the game, or even more so bringing players to the studio and having them doing some user tests so we can just look at the cold hard facts – how they are using or not using some game mechanics. That allowed us to do a lot of balancing using the metrics of the game. Q: One thing I’ve seen mentioned a lot is that the game has a lot of verticality in its level design. What are the difficulties around designing levels this way? Olivier Proulx: The first difficulty is you look at your screen in a 16x9 format – it’s horizontal right? So you tend to look from left to right and you’re not necessarily compelled to look up all the time. So that’s the challenge in a dense hub environment or sandbox. For us it’s really important to have proper UI that guides you to the right direction – a lot of the environmental storytelling and different signs, having a ladder just in a way that it catches your eye. So it goes a lot through the art direction as well. Sometimes it’s adding a bit more light to an area, or maybe some drapes that are moving so it catches your eye. There’s a lot of subtle tricks we use in level art and special effects and lighting effects to draw your attention to different areas. We don’t wanna make it too much in your face – I think it’s rewarding to look around and find a lot of stuff by yourself. I think a clever player will find vents and different lifts, like forklifts that you could use to go around some of the challenges. But from the get-go you start in Jensen’s apartment, and he’s pretty high in the apartment building. So you’re already playing with verticality as soon as you start the Prague level, and you already get a feel for locked doors and vents – they’re all there at your fingertips and very enticing for players. 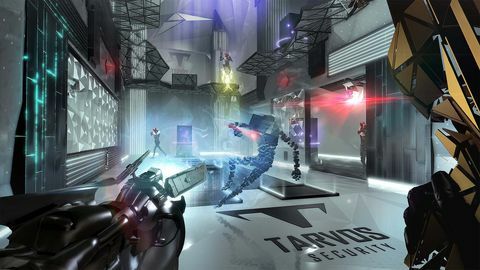 Q: Mankind Divided is a prequel, but the tech in the game is more advanced than that in the original Deus Ex, which takes place after it. Do you feel hemmed in by the timeline of prior games? Olivier Proulx: Not at all, actually. The original Deus Ex is in 2052, HR is in 2027, and this one is in 2029. 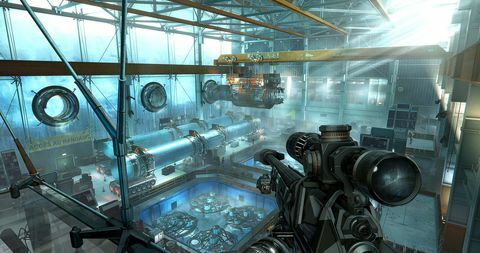 So, we have a lot of leeway between the games, and we certainly are using some elements from the original Deus Ex. We have characters coming into play – in Mankind Divided you will be meeting Bob Page pretty early in the game in some of the early cutscenes. So yeah, we’re using the lore from the original Deus Ex. 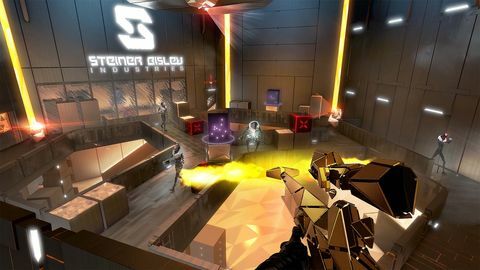 But we feel that history is always written by the winners, so what happens in the original Deus Ex compared to what happens in Mankind Divided, we feel there’s maybe a bit of creative leeway there. 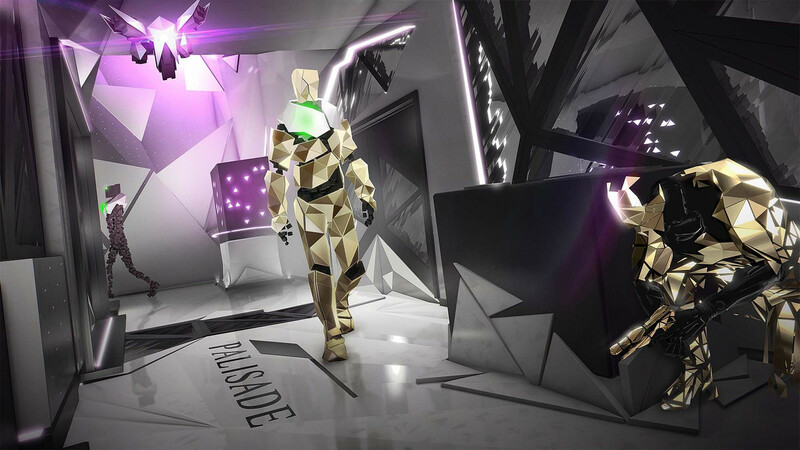 Q: Mankind Divided features multiple endings. What does that mean for the next game? Olivier Proulx: I’m not sure yet how we are going to manage it to be honest, because we haven’t thought about the next one. One thing is for sure: we wanted to keep track of a lot of the major choice and consequences done by the player. So this time around when you’re completing the game we basically are locking your save game with a lot of the tracking you’ve done in the game: what you have in your inventory, who’s alive, who’s not, which version of the ending you triggered – all these things. We just want to give ourselves the option to use all these choice and consequences in a way I guess we’ll discover a bit later if we have the option to work on another Deus Ex game. But right now, we open the door to be able to go back in and track what the player did. Which is something we didn’t do in HR, which is why at the beginning [of MD] it’s a little bit more ambiguous. But if we wanna do a sequel we’ll be able to use your choices as a starting point for sure. 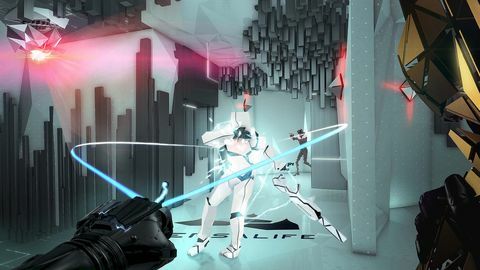 Q: Is it possible to complete Mankind Divided without killing anyone? Olivier Proulx: It’s possible. 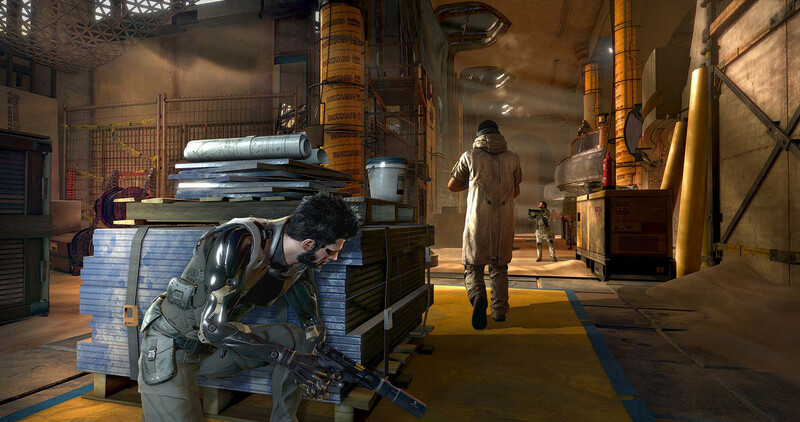 It’s difficult – a good challenge to any Deus Ex player – but it’s possible. We have loads of good non-lethal augmentations as I mentioned earlier. Stealth is definitely very strong, and you’re not funnelled into killing anyone like the boss fights in HR. We always joke around in the team that ‘bosses are people too so you don’t have kill them’ [laughs] That has been the mindset behind designing these challenges. Q: In Human Revolution Director’s Cut, you could find things in the world that direct you to behind the scenes stuff on your smartphone. Is that a feature in MD? Olivier Proulx: We have the Deus Ex companion app that’s already out there, and you can use it to scan little triangles and this gives you bonus content. It unlocks on your app some dev commentary into why this or that was created, some background information on what you’re playing through. It’s really just something for fans to sink their teeth into – our core creative directors offering a lot of the thought process behind the thing we’ve created. Q: Can you talk about the tech behind MD? I understand you used a heavily retooled game engine. Olivier Proulx: We started with the G2 (Glass 2) engine, which was used by IO Interactive for previous Hitman games, and we heavily heavily rewrote the pipelines, the rendering, processing. We developed a lot of tools that make sense for Deus Ex games, so for instance you have really powerful scripting tools in there. It’s an engine that’s very level artist friendly, so they can use it to create very detailed assets. Also, the amount of conversations we have in the game meant we have different pipelines that allow our designers to create those conversations in a more systemic way. So it has definitely been a challenge to develop your engine, and I think that’s one of the main reasons why it took a bit longer to get to the sequel we have today. To be honest, there have been some growing pains. When you develop your toolset and your game at the same time, sometimes the tools are not as stable. So if anyone in the team reads this: we know it has been difficult sometimes! 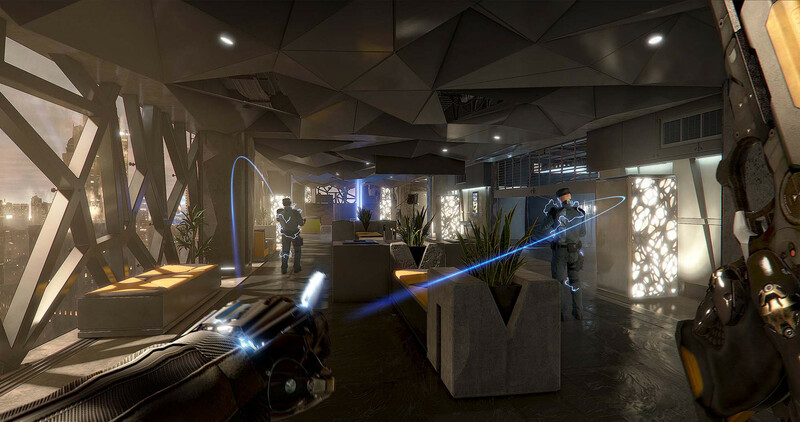 But we think ultimately having our own technology and knowing where to invest in the future is a great investment for Eidos Montreal, especially to produce the type of experiences we want to convey with Deus Ex. It’s great to have the option to invest where it makes sense for us. I think the end result is the environments are very rich. We are very happy with how it turned out, and we can improve a lot of things in the future too. Q: For how long were you working on the engine and game simultaneously? Olivier Proulx: I would say it was almost a year working a lot on the engine. We still had part of the team trying to build new assets and obviously work on the story and work in an active way on the game, but there was definitely a chunk of early production that was a bit blocked by technology. We tried to get the gameplay teams on board as soon as possible because we knew we had to rebuild a lot of the systems from Human Revolution. The impact on the team is you have to work a bit slower because your tools are not as mature. But that’s something we knew about early in production so it was not a big surprise for us. Q: How many worked people on the game at peak production? Or is that info confidential? Olivier Proulx: Ha, yeah I’m not going to give the numbers, but yeah it’s a pretty big team. But for a triple-A production, we’re still a tight-knit group. 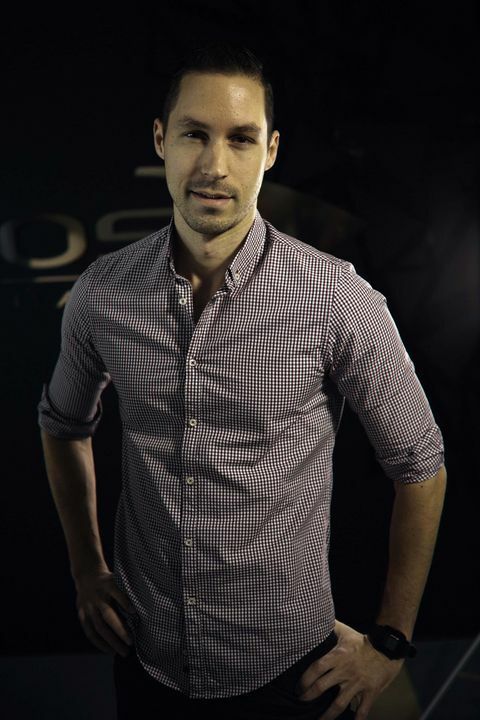 The main resource we have at Eidos Montreal is a great team that has a lot of experience. We have a lot of veterans from the industry that come from EA, Ubisoft, a lot of other studios, and also veterans from working on Deus Ex. We have a large portion of the team – not only the creative team, the level designers, artists, AI programmers, technical game designers – they really know the systems. They went through it with HR, and I think they came into this production with a good understanding of what worked and what didn’t work. We really built on top of that expertise, and we have a really good team who has been working on Deus Ex for eight, nine years now. Q: Breach mode and its leaderboards aside, was there ever talk of a multiplayer mode being developed? Olivier Proulx: Aside from some discussions here and there, it never was a serious option for us. I think what we’re good as is producing very immersive single player deep narrative experience with a lot of sophisticated mechanics. We didn’t wanna divert our resources to build multiplayer technology – that’s not where we can shine. We just want to have a concentrated focus on what we’re really good at. We focussed on building the best Mankind Divided experience possible. As for Breach, I think that came though when we saw we had all these great mechanics. We thought, ‘Hey, let’s unleash them in a less credible world, something that’s more arcade-y, what happens if we do that?’ And when we started to build test levels it was a lot of fun. People liked the element of competition with leaderboards and challenging players. We think it adds another dimension to the franchise that complements the core pillars of our game really well. Q: There was a minor stir last year around your use of the term ‘apartheid’ – a fuss I personally thought was ridiculous. Sci-fi often comments on real world concerns. That said, now that you have used that term, people will definitely draw parallels between the plight of the augmented in Mankind Divided and that of non-whites in South Africa and beyond. How do you approach subjects as touchy as racism and segregation without causing a firestorm? Olivier Proulx: I think it’s approached with a lot of research, and we wanted to make sure we touch on those themes so they are treated respectfully and are presented not in a black or white situation in the game. I think that video games are allowed to explore mature themes, and it’s a fantastic media to be able to explore some of those themes as you are so involved in the story from a first-person perspective. We didn’t wanna put judgement on those two sides of the equation, it’s just about presenting all the things in a very respectful manner. We’re very careful with that, and we’re not setting out to put our opinions out there on the themes – it’s just putting it out there for the player to use their own judgement to assess.